Southeast Asia is an amazing region to travel even on a tight budget. Travel costs are extremely low while still giving you a lot of great value, so its popularity with backpackers is no coincidence. That said, not everywhere in Southeast Asia is equally cheap, so it’s worth doing a budget calculation that takes into account which countries you’ll spend most of your time in. On a longer trip, plan on spending about $35/day for one person on average, or about $1000/month. For two people sharing, a good rule of thumb is $50/day, averaged across the region. 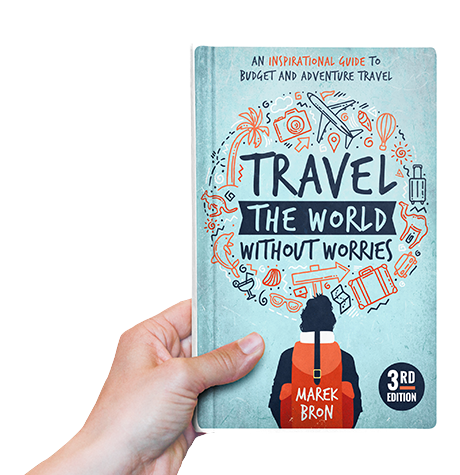 The suggested daily budgets assume you are a backpacker sleeping mostly in fan-only rooms, using mostly overland transportation, eating mostly local food, and avoiding big resorts and upmarket hotels. As always, your mileage may vary. Thailand has long been known as a backpacker mecca. But while the north around Chiang Mai remains one of the world’s cheapest places to travel, if you’re anywhere near a beach, expect to spend at least twice as much as in the regions further inland. The gradually gentrifying backpacker district of Khao San still has some ultra-cheap dives ($5–8), but for a bed in a modern and reputable hostel with full amenities, the cost averages at about $12.50 a night. Thanks to ubiquitous street food, an efficient metro system, and cheap tuk-tuks, your overall budget for Bangkok won’t need to be high. The north can be delightfully cheap. A dorm bed goes for as little as $4 a night here, though keep in mind such ultra-cheap places may expect you to also book tours with them (and will get cranky if you don’t). Decent rooms can be found for $10 (e.g. think bamboo bungalows in Pai). In Chiang Mai, $30/night can get you a fantastic room with pool access. The beaches attract plenty of tourists on a short stay and with money to spend, so it should be no surprise it’s more expensive here. Prices are also more sensitive to seasonality. The above average does hide some significant outliers. 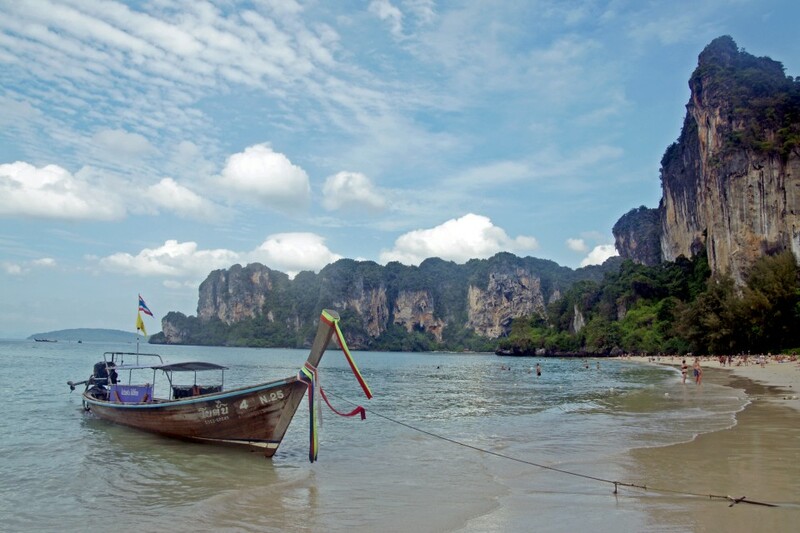 Koh Phi Phi takes the cake with basic twin rooms normally costing $50–80 and many dorm beds exceeding $20/night. Arguably this island is a victim of its own success, and I’ve noticed even Lonely Planet no longer lists it in its Top 20 (make of this what you will!). On Koh Phangan, prices will easily triple on or around the date of the Full Moon Party, rising to at least about $15 for dorms or $40 for rooms, though some dorms near the Full Moon beach may cost as much as $40/night. For substantially cheaper and more laidback islands, go to Koh Lanta, Koh Lipe, Koh Chang, Koh Tao (for the most part), and many others. A meal from a street vendor or local restaurant should cost around $2 to $6 pretty much anywhere. Many activities are priced in the $10–20 range. For instance, half a day of cooking classes in Chiang Mai might cost you $20. Visiting the Grand Palace in Bangkok costs about $13. In northern Thailand, a day of caving or trekking with a guide will set you back somewhere around $20 as well. Laos may be marginally more expensive than Cambodia or Vietnam (mainly due to being landlocked and having to import many of its goods), but most travellers still surely won’t bat an eyelash at the prices. Those on a shoestring budget can find a dorm bed for as little as $4. Basic but nice rooms go for about $30, though if all you need is a purely functional room you can find them for as little as $12 in places like Vang Vieng. Entrance fees to parks and temples are typically in the single digit dollars. A good rule of thumb for transportation cost is that every hour spent on a bus costs about a dollar, so a 10 hour overnight bus from Luang Prabang to Vientiane will cost somewhere around $10. A popular way to enter the country from Thailand is the 2-day slow boat from Huay Xai to Luang Prabang, which costs about $50, though this includes an overnight stay in Pak Beng. In Vietnam, money leaves your wallet at a syrupy slow rate. Accommodation is among the cheapest in Southeast Asia, and entry fees to museums and national parks are rarely more than a dollar or two. Those wishing to save on their meals will find that Vietnam is simply a street food paradise; just grab a little plastic chair at a roadside eatery for some delicious pho noodles (about $1 per bowl) or some passable local ‘fresh beer’ (about $0.20 per cup). Among your big expenses may be your entry visa ($45 for the visa itself and the stamping fee), a tour of Ha Long Bay (about $60 for two days, or much more for increased comfort), or a day tour of the Mekong Delta (about $40). You do often get the sense that tourists here are seen as chickens to be plucked, so keep your eye out for taxi meter scams and other trickery, particularly in the cities. 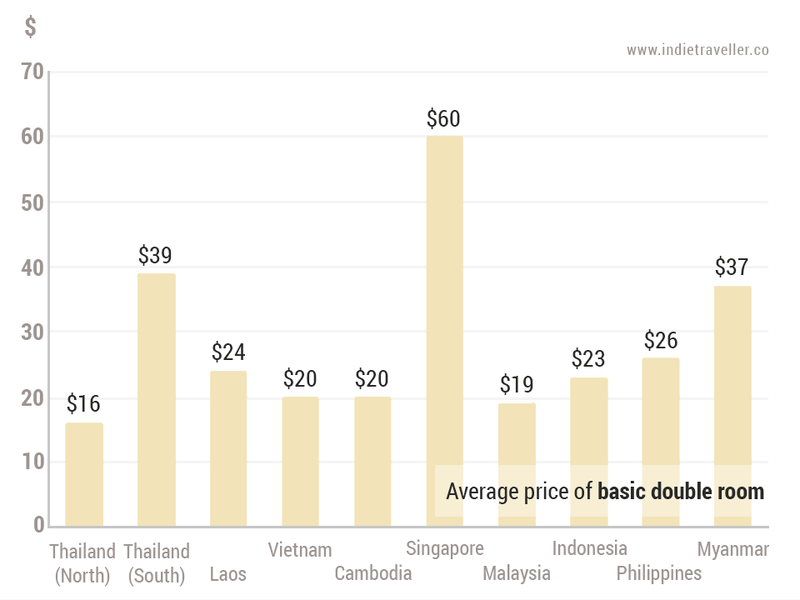 Cambodia may well be the cheapest country in Southeast Asia. Tourism is very backpacker-focused, with $4+ dorm beds and $15+ twin privates being the norm. One exception is Siem Reap near the temples of Angkor Wat, which attracts a few well-heeled tourists as well, but even here you’ll find a brilliant buffet of budget options. Your biggest single expense is likely to be your entry ticket to the temple complex of Angkor Wat, which is $20 for a 1-day pass or $40 for a 3-day pass. Update: as of February 2017 this is now $37 for 1 day and $62 for 3 days. This could impact your budget significantly if your main focus is visiting Angkor Wat. Hiring a tuk-tuk to take you around the temples for a day costs around $15. Entry fees to museums are typically in the low single digit dollars. For instance, the entry fee to the Killing Fields memorial is $3. Street food options are a bit more limited here than in Thailand or Vietnam, so you may have to hit up restaurants a little more often. In a nutshell: clutch your wallet, this place ain’t cheap! Singapore is an ultra-modern city-state with obscene cost of living (just ask anyone who’s had to rent an apartment here). Prices can be a shock for travellers coming from Indonesia or Malaysia. A dorm bed averages at $24 a night, which can be a whole day’s budget elsewhere. To stay cost-effective, some dorm rooms in Singapore have up to 20 beds—not a fun prospect if you’re a light sleeper or want some semblance of privacy. At least the excellent metro gets you just about everywhere for a few bucks, and cheap and delicious food is available at big food courts called Hawker Centers. There are a number of things to do in Singapore on a budget, but if pressed you may wish to skip paid attractions like the Singapore Zoo. Alcohol is taxed heavily so you may wish to avoid a big night out as well. Suggested Backpacker Budget: it depends hugely. If you’re just transiting through you can keep it to $40–50 a day, but a lot of sightseeing, going out, or restaurant food can push this to $50–90. Independent travellers sometimes label Malaysia as an ‘expensive’ country, but I don’t think this reputation is entirely deserved. Your opinion of the costs will probably be highly dependent on what exactly you do in Malaysia. If you’re crazy about adventure activities, then be prepared to spend relatively more. For example, if your goal is to climb Mount Kinabalu on Borneo, a 2- or 3-day guided trek will easily cost several hundred dollars. Permits are limited and demand is high, pushing up prices for this bucket list experience (be sure to book early). Similarly, a 2-day jungle river expedition in Kinabatangan park costs around $90, which is definitely more than it would have cost in some other Asian countries. On the other hand, day-to-day travel costs are extremely reasonable. In fact, Malaysia offers excellent value for money despite having a higher standard of living. Hostels are modern and often equipped with AC but still charge around $10. Basic private rooms are available at essentially Vietnamese prices but with much better facilities. Hawker centers provide all kinds of delicious Malay, Indian, Chinese and Burmese dishes all in the $2 – $4 range. If you’re a party backpacker, you may be aghast to learn a half-liter beer costs about $3.50 and immediately scuttle back to Thailand. (Malaysia is generally a more conservative country and not a party destination.) If instead you’re here for cultural sights or for that hammock on a quiet beach, you may feel right at home. The cost of travel in Indonesia will be fairly elastic depending on where exactly you go. Bali is the main tourist hotspot, and southern areas like Seminyak and Kuta are popular with many short-stay tourists from Australia and elsewhere, so these places are the most commercialised and expensive. But head to nearby Canggu or Ubud and prices already drop considerably. You can find wonderful bungalows and homestays here at around $20 a night. On the super popular Gili islands, many hostels charge $12 and up for a dorm bed. 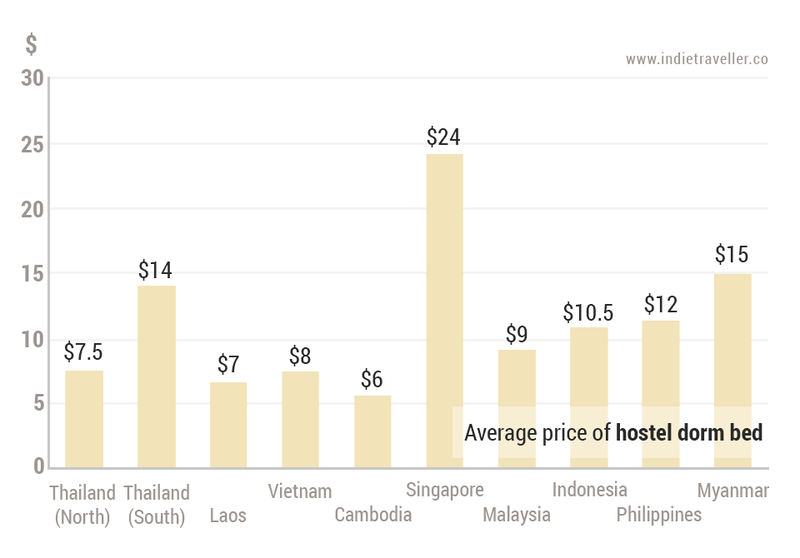 If you go to less-visited Java, Sumatra or Flores, you can still find many $6 or $7 a night hostels. This is just to illustrate the differences between focusing only on the Bali and the Gilis, or travelling Indonesia at large (which can easily be 50% cheaper). As of 2014, entry fees for national parks or UNESCO sites such as Borobodur or Prambanan are substantially higher than before. It typically used to be just a few dollars, but nowadays it’s around $10–15 (for international visitors only). Some travellers working with outdated travel guides still complain about these costs or even perceived discrimination because Indonesians can enter at the old prices. As with Malaysia, adventure tours can be more pricey compared to Vietnam, Thailand, or Cambodia. For instance, a 3-day tour of the Bromo and Ijen volcanos on Java will cost about $130 once you’ve factored in all the add-ons you need to buy (extra fees for a jeep ride, guide, etc.). A multi-day boat trip from Lombok to Labuan Bajo costs about $140. It’s well worth it, but it’s just a relatively larger expense than, say, the slow boat in Laos or boat trips to Ha Long Bay. When budgeting for the Philippines, there are some things to keep in mind. First, accommodation prices are definitely on the higher end for the region. Second, since the Philippines is such a huge collection of islands, it’s not always possible to travel cheaply overland. Ferries between the islands can be impractically slow, so some internal flights may be necessary. AirAsia, Cebu Airlines, Zest Air, and other airlines do offer domestic flights at budget prices. That said, entry fees to parks, wildlife sanctuaries, caves, and so on are typically in the $1 – $4 range, and guided tours and treks are all reasonably priced—around $10 to $15 for a day’s activities. An area where you’ll find some exceptions is Palawan, where a 2-hour tour of Puerto Princessa Underground River costs $11, and a day of island hopping around El Nido costs about $28 (this is up from $10 a few years ago). Boracay island is the Philippines version of Phuket or Bali (i.e. a more commercial holiday destination), but it’s more mid-range priced and still quite backpacker-friendly. Myanmar is a bit of an odd duck in this list, as its average accommodation prices are not necessarily indicative of travel costs overall. Under the old pre-2012 regime Myanmar received very few visitors, so the country has historically had few hotels. High demand and a limited selection kept prices up. While many brand new hostels have opened in recent years—making things easier for budget travellers—accommodation costs do remain relatively high. That said, other expenses like food, activities, and tours may be lower than you might expect based on the costs of accommodation. A 5-day pass to the temples of Bagan costs $20 (compare this to $60 for Angkor Wat in Cambodia). A train from Yangon all the way to Mandalay is just $15. You can rent a bicycle or motorbike to explore Bagan or Lake Inle for as little as $5 a day. With tourism still in relative infancy, fewer businesses charge hiked up tourist prices. I am from Jamaica.I want to travel to Vietnam,Cambodia and Loas for a month in August.I am a solo female traveller. Could you suggests the route , where I could stay and do on a budget. It’s hard to say without knowing anything about your personal goals/interests! Maybe read this Thailand itinerary which is pretty standard. There are also some Laos routes here. You could do Chiang Mai, Mae Hong Son, Luang Namtha, Luang Prabang, Nong Khiaw, and maybe some southern Laos. Just one example. Heya Marek. Doing a similar trip. 3 months on my own through mostly Northern Thailand, Laos, Vietnam, Cambodia, potentially finishing up in Gili T Bali. 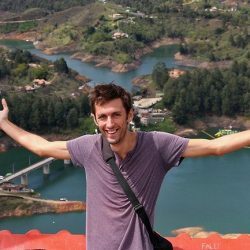 Backpacking on the cheap, mostly overland travel, interests include tramping, nature, people, meditation, etc. I’m thinking around 6k NZD tops. This a good estimate?? Thanks in advance my friend. 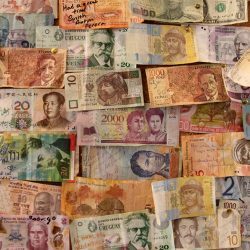 For the costs just try to estimate how long you’ll be in each country, multiply by estimated daily budget, and add the cost of your flights. There’s not much more I can do without knowing your trip duration or travel style! But you can make a back-of-the-envelope calculation based on info here and elsewhere online. Hi buddy. Im gonna travel thru Thailand, Myanmar, Laos and Vietnam for 70 days. Do you believe 2500 dollars for everything, including transportation, is totally possible or will I find some struggle? Yep should be just about OK. Depends how long you’ll spend in Myanmar though (accommodation is more expensive there) and if you’re going inland in Thailand or on the coast (Thai coast is among the most expensive areas). Ps: and cambodia as well! I’m planning a trip to SEA for January 2019. I’m going for about a month. I’m a solo female traveler and I am more interested in the nature/cultural side of things, rather than partying. I was wondering what you would suggest regarding how many countries (which ones?) you would suggest seeing in this amount of time. Hmmm well I love Laos for its nature, culture, and rural life. You could combine it well with northern Vietnam, which has a lot of great food and city culture in Hanoi. The Angkor temples seem very expensive. Is that the only way to check them out, paying those fees? Hope someone would be able to help and advise me. Me and my girlfriend are planning a trip from the UK to SEA. Beforehand we are going to fly into New Delhi see th Taj Mahal and then get a flight from there to Yangon in Burma. We then are going to go by plane to Chiang Mai, and then do Thailand, (maybe Indonesia), Cambodia, and Vietnam. We will be buying our flight to New Delhi and to Yangon separately. Would this be a sufficient amount to last us? Many thanks! Hi everyone, I hope i can get an answer for my inquiry. Im planning to take a cross-country trip to South east asia. Is this site talking about visiting all 8-9 countries in just one tour package? If it is, how long is the entire tour? How many days of stay per country? 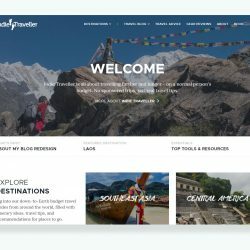 This site is about independent travel (making your own plans) not tour packages. Just one question. I am planning on travelling by motorcycle for much of the trip (Vietnam, Cambodia, Thailand and Laos) and am just wondering what the best/cheapest option will be. ie. renting for months at a time (seems to be ~ $450 odd) or just buying and then selling later on? Thanks so much for your time Marek, really appreciate it. I’m planning a 3 mo SEA trip with my GF starting at the end of August through beginning of December. I know monsoon season can be a concern but that’s how my availability works. In no particular order we want to do something like your 2 month plan and add in Malaysia and or Indonesia. How would you suggest planning the countries/order the trip based around weather? Just want to clarify, and not sure if you have covered this already in previous comments, but when you say ”On a longer trip, plan on spending about $35/day on average for one person, or about $1000/month. For two people sharing, a good rule of thumb is $50/day, averaged across the region” is the rule of thumb of $50/day for two people sharing 50$ each or 25$ each? I meant 25 each, based on the idea that as a couple you can share your accommodation costs, cook meals yourself more often, etc. It could be a slightly optimistic estimate now that I consider it again – but the main thing is really that you can split the cost of a room. First of thanks for your quick response. Countries that are near like; Bangkok, Thailand, Cambodia, Vietnam, I can travel by land. Not sure if it’s safe. But i hear flights are affordable. Do you think 2 months is not enough? You’d spend just several days in Bangkok (which is hardly a great impression of Thailand), then sit in a bus for 12 hours passing by many beautiful places you’ll only see through the window, to only get the shallowest impression of Cambodia (as I guess you’d end up only in Siem Reap). And so on. You won’t get any of the culture or nature or any depth, just hubs + lots of intense travel in between. I’m counting 16 countries and with 2 months that’s only 3 days per place (counting the 4th as travel day). I’d say that’s incredibly ambitious. Though of course that’s just my 2 ct 🙂 I acknowledge that everyone has different travel goals etc.! China> Hong Kong> Taiwan> South Korea> Japan> Manila> Philippines> Bali> Indonesia>… back to Singapore and return to New Zealand. budget of $7 000. Will that cover and can i do route as this? Wow Thank you so much for the update and the info. My girl and i have been planning since last November for a 2 months trip. I read your work and it helps allot. Keep up the good job buddy. That’s a tough one! I guess Bali is traditionally thought of as being quite romantic. Fantastic tips, facts and info regarding traveling SEA and much appreciated as me and my gf are planning a 3 month trip through SEA. 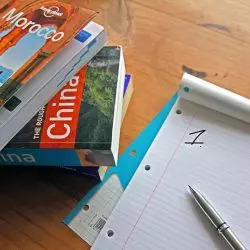 We are looking for a bit of advise or at least some sort of like guidance too see if our ‘plan’ is alright or if this is a common route for backpackers. Start Philippines -> Hanoi -> Ho Chi Minh -> Cambodia -> Laos -> North Thailand -> South Thailand. Of course with all the stops on the way, but after Thailand we were either thinking of Myanmar(Burma) or Malaysia (if time and money are there). My question is: Is this a common route for backpackers and possible? 2: if time and money is available .. Myanmar or Malaysia? Sorry for my slow reply Morten! I suppose it’s not a common route, but it seems sensible to me. Between those countries, I would personally go for Myanmar for the cultural experience. No worries mate, all good! Just a quick question regarding visa’s to the different countries, is there anything we should be aware of or is it very easy to get it once you cross the border? With your EU passport you normally just show up and get a visa on arrival, so very easy. It’s more complicated with Vietnam though. 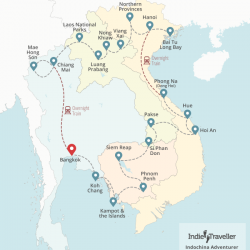 See: https://www.indietraveller.co/how-to-get-a-vietnam-visa/ Myanmar I believe also still requires making some arrangements in advance. US$20 to US$30 in Cambodia sounds rather unrealistic now, the enter fees have soared! Getting to some of the less visited temples can be very expensive too (e.g. Preah Vihear) as you probably need to get there by private transport, cheaper if you can go there with friends or other travelers. Cheers for the update on Angkor Wat. Do you remember how much hiring the tuk-tuk cost? Based on the food and accommodation prices I collected in January I’d say travelling the country at large is still possible at that budget, but if your main target is Siem Reap / Angkor Wat on a short visit then the higher entry fees would definitely have an impact. thanks for the detailed budget overview for backpacking SEA. In addition to the question which appeared here regarding how expensive Cambodia got, we can link here our article about our expenses for traveling Cambodia for 1 month. Budget for person 2 years ago was around 15$ per person. To sum it up: It’s still possible to travel Cambodia on budget if you share tuk tuks and avoid overstaying in Siem Reap and instead spend more time in the rural areas. Hi, I looked for some of the accomodation you recommend but they are permantely closed! Is that right? Heya! If you like nature then Laos is a nice country to stay a bit longer, also northern Thailand and northern Vietnam (Sapa etc.). 4 months should be plenty of time for these countries, so you can play it by ear and move on when you think you’ve seen everything you wanted to see in a place. Visas on arrival are typically easy to get if you’re from a Western country. Make sure you check for Vietnam though as this country still usually requires already having a visa before you cross the border. You can get them in Laos or Cambodia during your trip, but you might have to wait a couple of days for them to be delivered. Sounds like you and I have a very similar itinerary. I’ll be leaving New York at the end of June for three to four months. I’m travelling se.a for five months, starting in july. I was wondering if you would recomand bying tickets in the region before travelling, or just during? What is the cheepest, and what would you recomand? Hey Sara. By tickets do you mean flights? On such a long trip I think it’s generally better to book things (flights, tours, accommodation) only a few steps at a time and while you’re traveling. It’s often cheaper that way, and you keep things flexible. mate, this is one of the most detailed and accurate info that i have seen about back packing. very well written and thank you for your writting. Do you have any info on getting visas? I’m pretty confused and don’t really know where to start. That really depends on what country you mean. Amazing amount of info – thanks for sharing your experience! I’ve not yet been to China unfortunately. Searching on booking sites for accommodation costs and looking on sites like Price of Travel might help. I’m looking to travel around SE Asia in January 2017 from the UK for approx. 2 months. I was thinking of starting in Philippines and finishing in Thailand. could you give me any advice on which is the best country route to take on a budget. Since it’s such a spread out archipelago many routes are possible in the Philippines – have a look at my Philippines page for more. From Manila you could fly into Bangkok, go north in Thailand to explore the area in Chiang Mai, then head back south to the Thai beaches and islands (most people like to put some beach time near the end of their trip). Excellent information, I was thinking about visiting Cambodia and Vietnam on a shoestring budget and this just answered many of my questions. I am from India and have only been to Nepal other than India; not much acquainted with hostel accommodation. Hence I have a question: If we are two people visiting Cambodia and Vietnam,does it make much sense in booking dorm beds(Since we will have to pay for 2 beds)? It looks like booking a private basic room is a better option. Are 2 people allowed in one single private room? Not sure if I expressed myself well. Sharing a room between 2 people will unusuall be equal or cheaper to getting dorms, so that certainly makes sense. Not sure which country you’re from (as things can be different depending on your passport), but instead of a multi-entry visa for Thailand you could just get a visa-on-arrival twice. Fantastic article! My boyfriend and I are traveling to Southeast Asia this September and I am in the process of figuring out our budget. This article is very helpful so thank you for posting! I do have a question for you regarding accommodation; if it is a couple, would you say that the price would be the same for each individual or would you say it would be slightly cheaper? You demand respect for other cultures and yet your vitriolic post is full of hatred and disrespect towards English and Australian tourists. I understand that you may have had some negative experience but that gives you no right to throw everyone in the same category. Also, I am not sure what problem you have with swimwear or young people enjoying themselves. Hi Marek! This is awesome!! Now I feel my nerd research before travelling is not at all alone! Lots of work for me to process all this info though! So thanks a lot for saving me heaps of time. 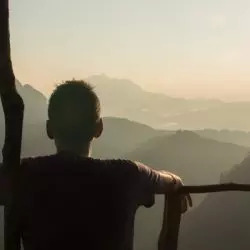 Superb article, in fact your comprehensive reviews and helpful tips have inspired to to undertake a backpacking trip around my own backyard of Southeast Asia at the end of the year. I can’t help but feel as if Singapore is being regarded as a third world country simply because of its geographical location. Singapore IS part of the developed world, in fact the most recent survey by the Economist Intelligence Unit (EIU) continues to place Singapore as the most expensive city in the world to live in. Singapore’s GDP also trumps most countries within the Western Europe as well as the Americas. Nevertheless, it was a excellent article! I hope that you don’t take offence with my overzealous patriotic remarks, do continue to post on your travels! great post, very useful thanks. i never went to the adamant coast only the gulf coast of thailand and didn’t find it too expensive other than diving or a heavy nights drinking. my top tip is stick to drinking buckets when out or buy bottles of sangsom from the 7/11 and use it to make some new buddy in your hostel before you go out. always a winner. Hi Marek. Love this post, the comparative numbers are really helpful. Do you include travel insurance or getting TO the country in your numbers? Thanks! I’m only counting day-to-day costs in this post, not including up front investments like flight, insurance or equipment. Great article, Myself and my girlfriend are travelling on the 10th of February for 167 days. We will be going to Thailand Laos Malaysia Indonesia and Cambodia. We will be taking with us just over 9000 euro and have our flights booked travel insurance bought and vaccinations done. I’m wondering if you think this will be enough money? We would like to see and do as much as we can and will be mostly eating street food but will be staying in our own rooms and not in dorms. Hmmm translated to around 800 EUR/month per person it might be a bit tight – the usual recommendation is around 900 or 1000 EUR a month. That’s without knowing your exact travel style though, so it’s always hard to say. If you watch your spending you will probably be OK though. Keep an eye on your budget in southern Thailand or the touristy parts of Bali as the euros can flow more quickly here – maybe go elsewhere for beaches (e.g. Cambodia) as it’ll be much cheaper. If you share basic fan-only (non AC) rooms your accommodation shouldn’t be any more expensive than dorm beds. That’s a fantastic breakdown. Thanks for sharing! manila is the worse traffic in the world and hotel in tourist area are expensive.. i recommend vietnam or cambodia..